The real story of one of the greatest explorers who ever lived by the man described by the Guinness Book of Records as 'the world's greatest living explorer". 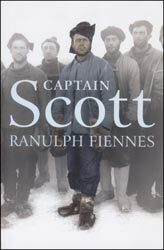 Sir Ranulph Fiennes is uniquely qualified to write a new biography of Captain Scott. For the first time Scott's story is told by someone who has experienced the deprivations, the stress and the sheer physical pain that Scott lived through. Fiennes has suffered all but the final tradgedy endured by the much maligned Scott: He is determined to put the record straight. As well as the definitive biography of Scott, written with the full and exclusive co-operation of the Scott Estate, this book traces the way that Scott's reputation had been attacked and his achievements distorted. Written with the energy and style that have made Ranulph Fiennes' other books so popular, Captain Scott is the enthralling story of an extraordinary man.